1. Ditch the mower bag. Those grass clippings will become food for earthworms and microbes that will help make your lawn green and healthy. 2. Sure, the view from the street is important, but don’t forget to look at your landscape from inside the house. If you have a room with a big window, make sure it looks good from there too. 3. Don’t fill every inch of your space with plants and flowers. By next spring, you’ll have a weeding and pruning nightmare. 4. You can send a sample of your soil to a local agricultural agency to have it tested. Dig down six to seven inches deep and then gather two cups of dirt into sample bags. Mail them off to find out what nutrients you need. 5. If you find a flower you like, always buy more than one. Plant clumps of species in odd numbers, such as five or seven in one area, or repeat the groupings throughout your landscape for a unifying effect. 6. 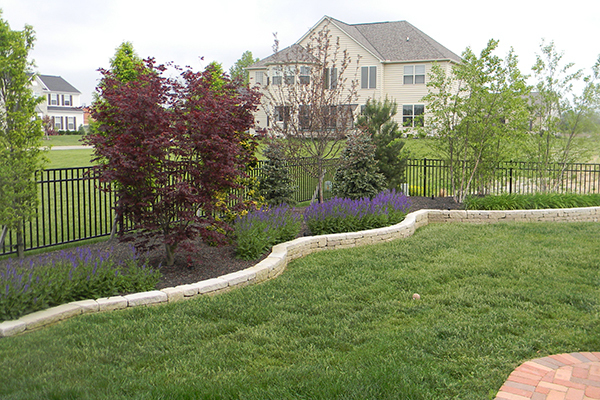 Do-it-yourself landscapers tend to make their planting beds too narrow and too close to the house. You want to extend your beds out at least one to two thirds of the house’s height, if not more. 7. Laying weed fabric is generally a waste of money and time for the long term; weeds just grow on top of it. I once had a customer whose beds had seven layers of weed fabric, yet she still had weeds. I guess she kept thinking, If I put down just one more layer, the weeds will stop coming. 8. To keep from overwatering your lawn, remember that one inch of water once a week is ideal, maybe once every five days in extreme heat, depending on your soil. Infrequent watering encourages roots to grow deeper to find groundwater, creating a stronger plant. 9. Looking at a color wheel is a great way to choose garden flowers. Colors that are opposite each other, like yellow and purple, look beautiful together.